Aged Refined Oil is a low acid value linseed oil perfect for diluting mediums, thinning oil colors and making your own oil paint. However, it also has many other uses besides making paint as one artist recently found: He exposed it to sunlight to thicken it with the purpose of making a light-bodied oil. What this did was to make an oil that when mixed with oil colors enabled wash-like glazes that looked almost like watercolor without being smeary or uneven. The oil dried to a very solid film within 1-1/2 days. Pale Drying Oil is fast drying linseed oil. 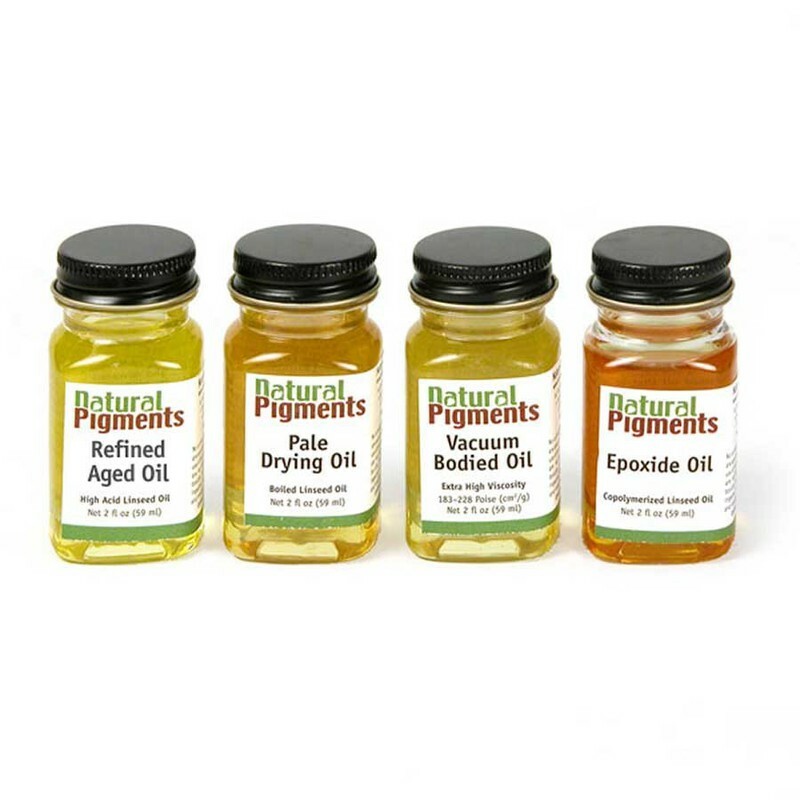 Add to oil colors to speed drying without the danger of adding excessive amounts of driers. Add small amounts—up to 30%—to oil colors to promote faster drying. This is a good substitute for fast-drying oil painting mediums. Contains a scientifically controlled amount of driers. Vacuum-Bodied Oil is a heat-treated and polymerized (thickened) linseed oil. It is made from well-refined linseed oil cooked in vacuum-kettles. Vacuum-bodied oils have lower acid values, better color and yellow less than tyical ‘stand oils’ obtained by conventional open-kettle cooking and unbodied oils. It provides gloss, flow out and leveling, and non-yellowing characteristics when compared to other stand or bodied oils. 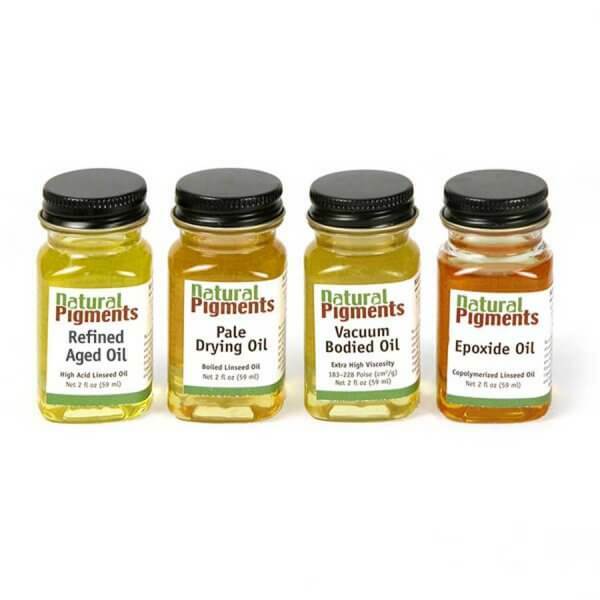 Bodied oils form harder films than raw or refined linseed oil. Epoxide Oil is a copolymerized linseed oil that is a fast drying oil with good chemical and water resistance. Copolymerized linseed oil provides a new vehicle for oil painting that behaves like a drying oil and fast drying resin. The difference is truly astonishing. Use it in place of natural and synthetic oleoresinous mediums to speed up drying and improve film formation. Warning: Rags or paper towels contaminated with vegetable drying oils, particularly those containing iron oxide pigments are susceptible to spontaneous combustion. To prevent unexpected fires, used rags or paper towels contaminated with oil-based materials should be collected in a closeable, air-tight container. Store water-dampened rags or paper towels in a metal container with an air-tight top. Alternately, washing contaminated rags will remove contaminating materials and eliminate risk.